Yesterday I brought you my favorite 5 Minute Guacamole. 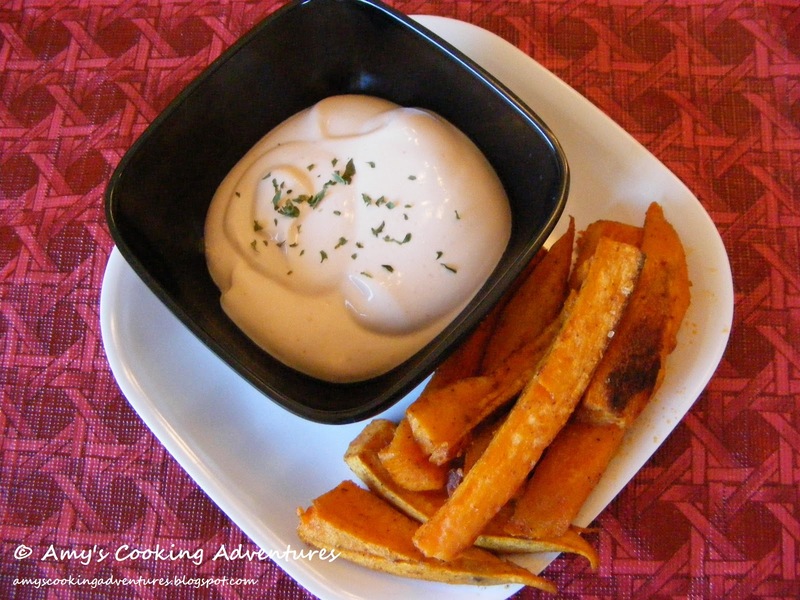 Today, I have for you an equally fast dip that is the perfect complement to sweet potato fries. The amounts may not look like much, but it is the perfect amount for two or three people (sharing fries made from two large sweet potatoes). I had originally planned to share a sweet potato fry recipe with this dip, but I am just not satisfied with the sweet potatoes at this point. Just a bit more tweaking and they will be ready. And they are going to be fabulous! The following recipe is very lightly spicy. If you really love heat, add more hot sauce to your tastes. I totally could have used more heat, but I played it safe for the company we had over when I made this. Mix the sour cream, hot sauce, and Worcestershire sauce until well blended. Keep chilled until ready to serve. Sprinkle with parsley just before serving. 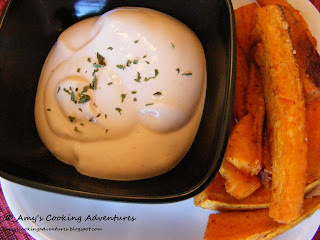 I love love love sour cream with sweet potatoes. Ever try mixing it with grainy Dijon mustard? It's serious stuff! I adore sweet potato fries. I like the idea of a spicy dip with them. I'm looking forward to seeing your recipe for sweet potato fries. I only like the ones from the Toasted Frog. Nothing else seems to be even close. Oh, I'm liking this dip a lot! Thanks for the great recipe. I love sweet potatoe fries! I'm try this right now! Love that this dip is for sweet potato fries. Now, Ill give you 1 million bucks if you can get the BF to try the fry part >.<!! Wonderful dip. I love the spicy factor. I just made these... and delicious!! Definite recommendation!